Want to make your foods like rotis, breads, parathas etc delectable? 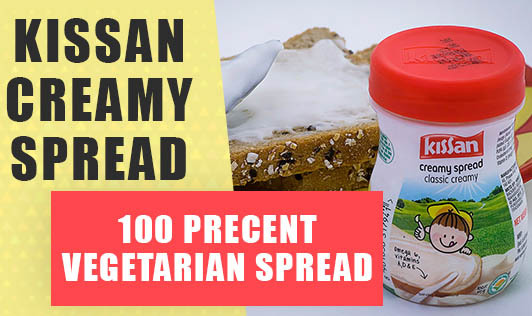 Here is product from Hindustan Unilever - Kissan creamy spread. It is 100% vegetarian and has spread the market with 3 of its variants - classic creamy, tomato twist and cheesy garlic. 1. Enriched with Vitamins A, D & E and Omega 6, the spreads contain three times the essential nutrients as compared to butter that are known to be essential for growth and development for children. 2. Suitable for spreading on both western and Indian breads and targets the ‘everyday' typical Indian household foods like roti, paratha, bread and sandwich among others. This product is priced at Rs 30/- for 100g and Rs 68/- for 250 g.
Being an alternate to butter, this creamy spread is dense in energy and fat, even when you apply a tsp of it. When used regularly, not only can it increase the weight but might also result in high body fat in a long run. I would suggest you instead to go for natural spreads made at home with peanut and channa (hummus - which is an Iranian spread) as a spread to breads, rotis etc. This is a wise option to enrich your diet natural nutrients, which can balance your diet, as a source of protein, helps reduce the body's fat content and purse too. Hence is suitable to all Indian adults and children. If you want a variant to the regular homemade spreads, ensure the creamy spreads like mayonnaise /margarine are not more than a tsp or 2 for a day. Kissan tags it to be consumed as a part of balanced diet and healthy lifestyle. So, think twice before you spread the spread!